The RLM AIR-SPIDER will balance/self regulate the tyre inflation pressure to a preset level on up to 8 tyres simultaneously. The AIR-SPIDER is capable of dispersing up to 4300 Ltr/min of air through the regulator and 8 hose assemblies, so it ‘s possible to inflate 8 tyres in approximately the same time as a 17 cu-ft compressor can inflate 1 tyre! NOTE: when the primary air pressure/volume feeding the AIR-SPIDER is reduced, the inflating time is proportionally increased. For correct tyre maintenance, we recommend all tyre pressures be manually checked prior to connecting the AIR-SPIDER, this practice will identify flat or problem tyres, which may need attention. 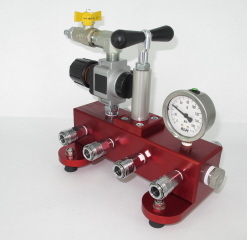 The 8 port alloy manifold is equipped with a high flow regulator, 63mm dial gauge, one touch Nitto outlet couplers, Eight hi-flex polyurethane hose assemblies – each fitted with Nitto one touch couplers and dual foot lock on air chucks. The operator can chose to use from one to eight outlets. 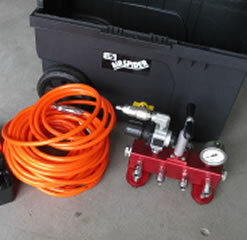 With the hoses connected to the manifold, simply attached the dual foot chucks to the tyre valves, Any imbalance in the tyre pressures at this point will begin to self regulate and equalize if given a couple of minutes, then connect the main air supply to the manifold and all connected tyres will inflate to your pre-set level. HINT: It takes less time to INFLATE all 8 tyres to a pre-set level, than the time required to inflate 6 and deflate 2. FOR EXAMPLE: If you require 85psi in all tyres, and your pressure check prior to connection indicated that two tyres were over inflated, simply connect the dual foot lock on chucks to those two over inflated tyres first, then disconnect their hoses from the AIR-SPIDER manifold. This will bleed air from those tyres – While this is happening, continue connecting the dual foot chucks to the remaining 6 tyres, then reconnect the two deflating air hoses to the manifold. – Now all 8 tyres will be inflating to your pre-set 85psi level. The air flow path is now traveling in the one direction. To benefit those with only one primary airline from the compressor, a shut off valve has been fitted to the AIR-SPIDER inlet, This will allow the operator to connect the lock on chucks to all 8 tyres so the pressures can equalize while the primary airline is used for another job. 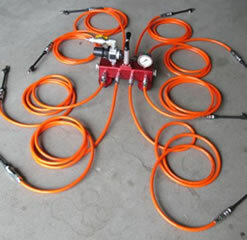 – Once that job is finished, simply connect the primary airline to the AIR-SPIDER and all 8 tyres will quickly inflate to the pre-set level. 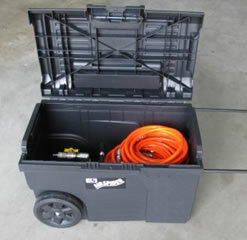 The AIR-SPIDER units are preset by the factory at 85psi.